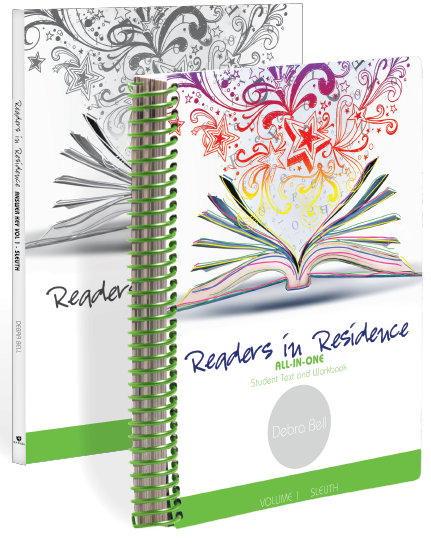 Readers in Residence Volume 1 - Sleuth is a new offering from Apologia Educational Ministries. For our review, we received the "full set" of books for the program (both the consumable/single-use student work/text along with the Answer Key).This new, literature-based curriculum can be used as a standalone reading/literature program, or in conjunction with Apologia's Writers in Residence to create a full (one year) Language Arts program. 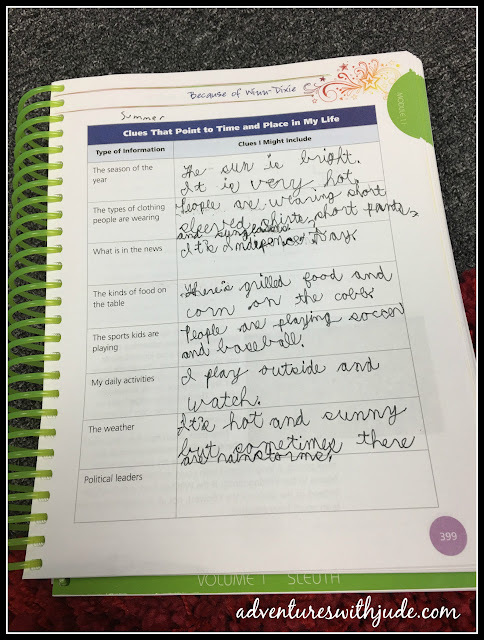 The target reading/comprehension level for the program is 4th grade, though it is also appropriate for older students. The answer key includes fixed replies (i.e., facts about the characters/plot, the correct answer of "choose simile or metaphor for this sentence," etc.) as well as suggested/appropriate answers for open-ended questions ("What do you think...," "Why did she..." etc.) While I generally read the books I assign to Jude, I appreciated both styles of answers because here, I hadn't read the book in a few years. I've found that it helps Jude to understand more when he's able to focus more on the story (characters and plot) and less on actually decoding the words, so usually we read the books aloud as he works through a literature study. To work on his independent reading skills, I expect him to read an age/grade level appropriate book for about 30 minutes each day. I had assigned him Because of Winn-Dixie as independent reading just before we received this program to review, so while I did read it when we began the RIR program, Jude started the first few lessons before I had a chance to catch up. I'm going to admit up front that overall this program didn't really work well for Jude, for a few reasons. First, to be successful with the program, you need to start at the very beginning. Each new lesson builds on prior ones; often there are references back to the earlier books. 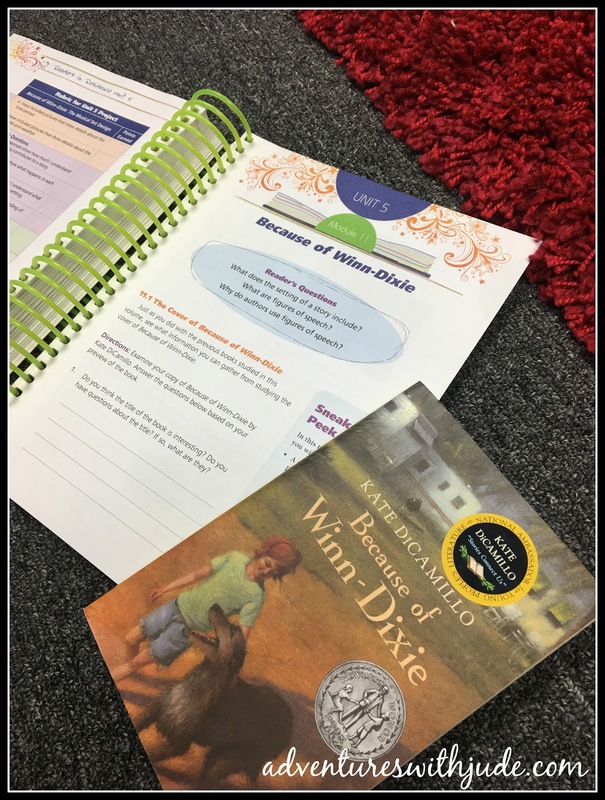 We had just finished reading Charlotte's Web using his regular literature program (different publisher), so rather than risk losing his interest by backtracking and repeating the book, we decided to dive in with Because of Winn-Dixie, the third book Readers in Residence studies. There were a few places where I needed to adjust the assignment/discussion. When they referenced the characters and/or story in Charlotte's Web, we were able to make most the connections, but since he hasn't read Sarah Plain and Tall, anything about that book we needed to skip over. It leaves Jude with a lot of gaps with this program. Note: You will need to get the books studied on your own; they are not available directly from Apologia. Also, specific editions are required - for example, you will need the 60th-anniversary edition (2012) of Charlotte's Web that contains Kate DiCamillo's foreword. If you are purchasing the book new, or have a newer library version, this shouldn't be an issue. However, our copy is from a 2006 printing - according to Amazon, I purchased it in 2008, back when Luke was Jude's age. Again, we were left with a gap because our book didn't contain this. You can find out the book titles needed by clicking through to download the Table of Contents (a 40-page sample of the program is available through a free download as well), but I think it would be much easier to have the titles/editions listed on the program's "purchase here" page(s). Second, each section teaches different literary elements and forms. For example, Unit 1 (Sarah...) addresses character development, and theme, while Unit 2 (Charlotte's Web) discusses the components of plot (rising/falling action, climax, etc.). Unit 3 (...Winn-Dixie) builds on both of these and adds the story's setting as a way for the author to propel the plot. Justs being familiar with the plot of one (i.e., what happens) isn't enough to be able to work efficiently with the next because Jude didn't have a good grasp of the terms (they are presented in a different way with his usual program.) Jude did well with newly introduced concepts but struggled with when they were "revisited" from earlier in the book. Overall, I felt the program was quite thorough with what it presented. Each presented book takes about six weeks to work through, and then allows time and structure for studying the "Your Choice" books. I'm definitely considering it for Damien because I like that it ties books together, so the student begins to see something pointed out in an "easier" book, and then it appears again later. For example, every story in existence follows the same concept of rising action-climax-falling action, and you'll want to know that for later as books get more complex - this is something that I find Matthew struggling with because he doesn't have a sound basis of how to find these in a story. However, he would be starting the program at the beginning (he sat with us as we read Charlotte's Web aloud, but didn't do a formal literature study like Jude did), and I think that would make a huge difference in the ability to do more than answer the fact-based "what happened in this chapter" questions. I don't believe this is a program you can switch to mid-year because you want to do a unit study that includes a particular title. You have to commit to the entire study, not just a section of it. Fifty families have been reading with Apologia's Readers in Residence program. Click the banner below to find out their experiences.